Your stay funds local non-profits! 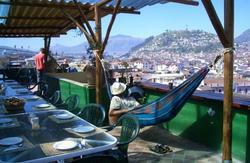 Community Hostel offers unparalleled service, knowledge, and comfort from the heart of Colonial Quito while allowing the traveler to give back via its non-profit foundation. Mere minutes from all Colonial Quito has to offer. Don't just travel, contribute! For a safe & secure ride, we have partnered with a licensed taxi cooperative, Cooperativa de Taxis Coliseo Julio Cesar Hidalgo. They will carry a car-full for $35 total (Price went up due to the distance with new airport). If you are interested in hiring a driver from our partnered cooperative, please feel free to call us and set an appointment. If coming from elsewhere in Ecuador, you will arrive in Quito from either the north or south bus terminal. From either terminal, you can take the Eco Via (Metro) or Trole, the two main public transportation lines, into the city.